“How do you eat that plain Greek yogurt by itself, Bex?” my housemate Abbey asked me one day as I made a breakfast parfait with Chobani plain Greek yogurt. Chobani’s non-fat plain Greek yogurt is an essential ingredient for many of my breakfast dishes, baking experiments and healthy snacks. It has always been my go-to for moist and creamy autumn pumpkin loaves and fresh fall apple and granola parfaits. When I heard that Chobani was getting ready for the tailgating season; I was wicked pumped. Ideas began running through my head of possible breakfastwithbex-inspired healthy tailgating recipes. Say “ta-ta” to the unhealthy chicken wings, pumpkin ales, greasy pizza and taco dip and say hello to some healthy Chobani-infused snacks that will satisfy your game-day cravings. This bruschetta is perfect as a tailgating appetizer, breakfast treat or even as a little celebratory dessert after that Buffalo Bills win! Your tailgate just got breakfast-ified! Stay tuned for even more #madewithchobani recipes coming soon! 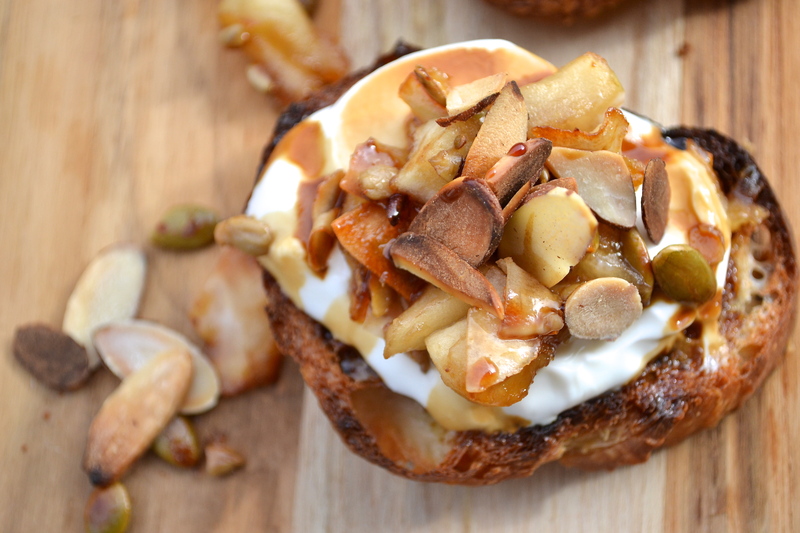 And be sure to check out Chobani’s recipe section for even more ways to use Greek yogurt! 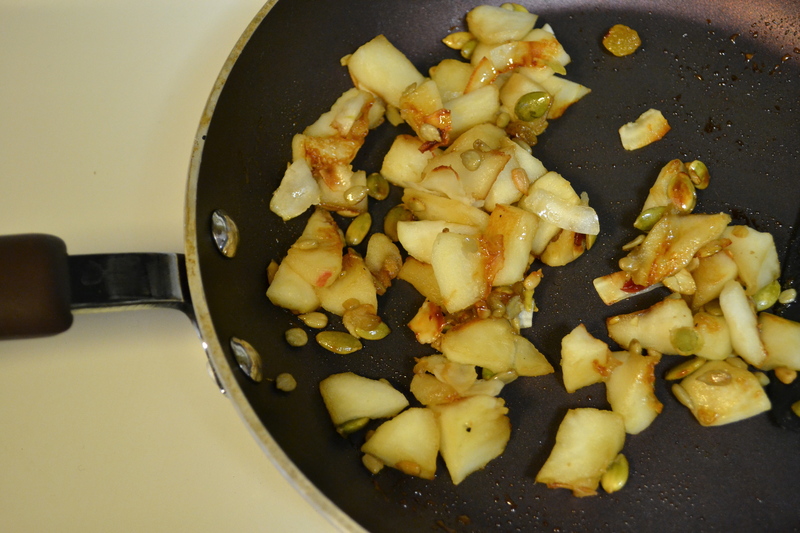 Cut Ficelle into ~1 inch thick slices and drizzle pieces with olive oil. Place in the oven for around 10 minutes or until crispy. 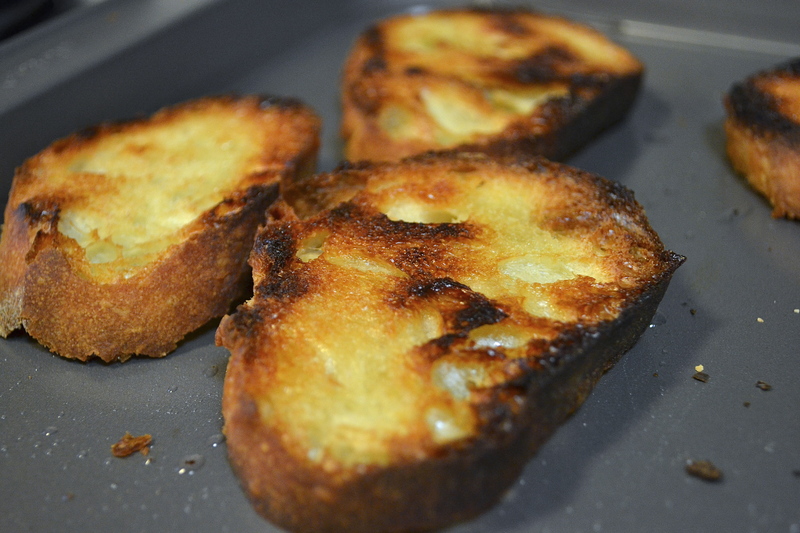 Meanwhile, toast sliced almonds on medium heat for approximately 8-10 minutes. Peel apple, dice and place in a small saucepan over medium heat. Drizzle with honey and sunflower kernels. Toss to coat evenly and cook for approximately 6-8 minutes until apple is softened and has a warm honey color to it. Remove bruschetta from the oven and let cool. 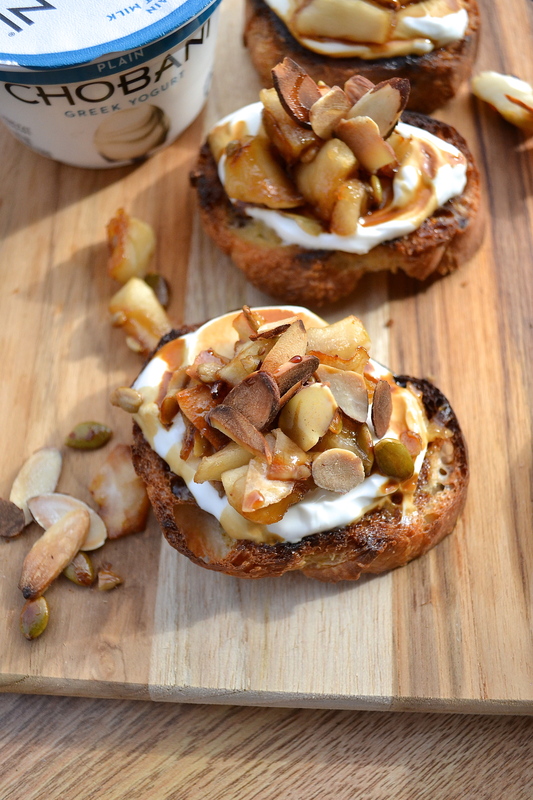 Spoon a dollop of Chobani non-fat plain Greek yogurt on each and spread evenly over toasted Ficelle. 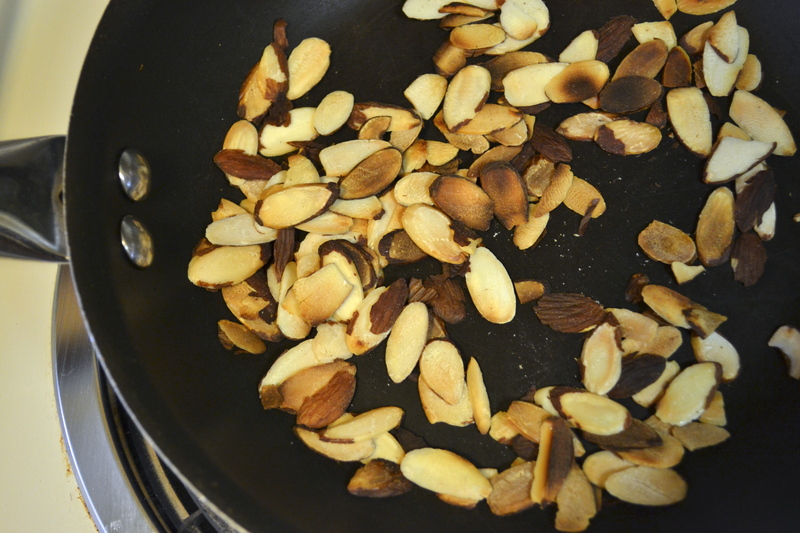 Next, add a spoonful of apple mixture then top with 5-6 toasted almonds. Drizzle bruschetta with the balsamic vinegar and bon appétit! Thanks, Andrea! 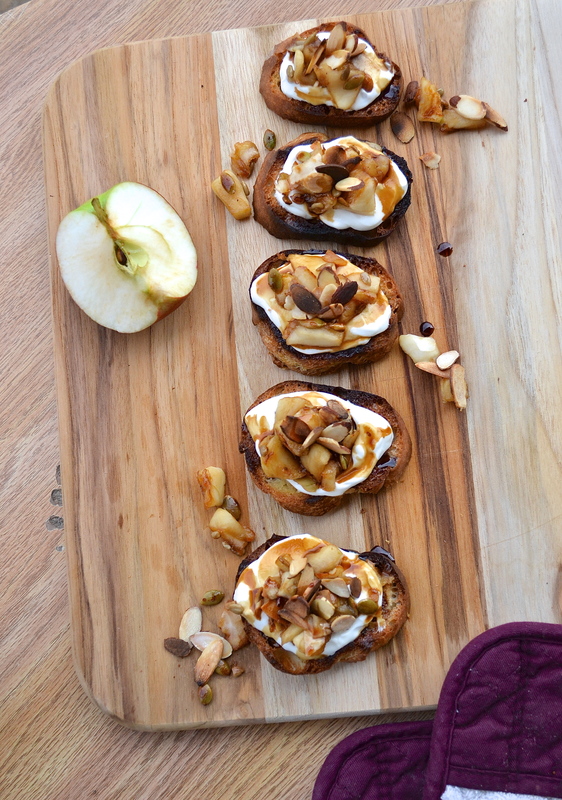 Oh, it would definitely be good with some toasted coconut flakes and I agree that caramelizing the apples in the balsamic would be delicious. Let me know if you do that; I’d love to hear how it is!